Artemis Hotel, is located in the beautiful capital of Antiparos and offers apartments, studios and room rental accommodations. The hotel offers a fully renovated atmosphere and is a perfect addition to your relaxing holiday in Antiparos Greece. You will be welcomed by lush gardens, spectacular views of the picturesque port and the deep blue Aegean Sea. 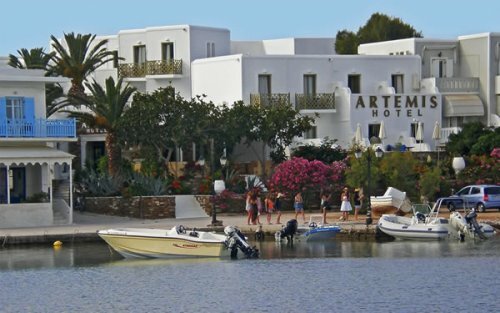 The Artemis Hotel is noted, as one of the most privileged Antiparos hotels. The attentive staff will welcome you with heart-felt hospitality and are available to offer you high quality services including, a fresh breakfast in the veranda. 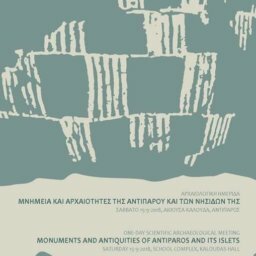 Artemis serene location in the Aegean, will make this experience unforgettable. Experience peaceful and carefree holidays in Antiparos and let us take care of your comfortable accommodation. In Artemis Hotel in Antiparos Town our main objective is you experiencing unforgettable holidays in one of the most serene locations in the Aegean. Artemis Antiparos Hotel has been fully refurbished to provide you with integrated hotel services and facilities guaranteeing a pleasant and relaxing stay in Antiparos. Here, you can relax in our comfortable facility, and enjoy a selection of fine drinks or light snacks. We are located right on the sea front, so as you sit back with your drink, you can admire the beautiful scenery and surroundings that we have been blessed with. During the hot summer nights, take a seat outside, and enjoy the cool sea breezes. There is nothing quiet like enjoying a drink out in the open, looking up at the stars, and feeling completely relaxed. Pets are also welcome at the Artemis Hotel Antiparos Apartments, Studios and Rooms in Chora Antiparos, Greece. Breakfast is served daily from 8.30 am to 10.30 am at the terrace of our hotel and costs EUR 8.00 per person. It consists of coffee or tea, orange juice, bread, butter and jam and then you may also choose between fried eggs, boiled eggs, scrambled eggs, cereal or yogurt with fruit. Please let us know the day before in case you are interested in having breakfast.